This Friday is a day of a definite and a possible: the definite is the Peregrine talk at St George’s from 7-8 (p.m.! ), with contributions from Dr Deborah Dawson and Dr Natalie dos Remedios (Animal and Plant Sciences at the University of Sheffield), Dr Dean Rea (Sorby Breck Ringing Group) and Professor David Wood (Sheffield Bird Study Group). 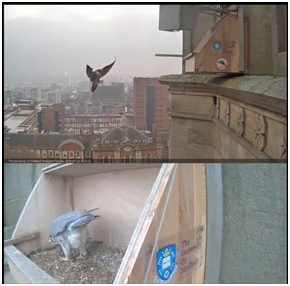 We will cover the different key aspects behind the Peregrine project, and from 6:00 p.m. there will be telescopes on hand for the chance to watch the Peregrines and ask questions. The possible is the young birds taking their first venture out of the nest, which is expected over next weekend, but could come on Friday. As is apparent in the picture above (and can now be seen when watching from below), they are giving their wings some good exercise, building up their flight muscles ahead of the big day. With less than a week to go until then, the young birds are taking an increasing interest in the world around them, and life beyond the nest platform. It never fails to amaze how quickly they transform from essentially white and fluffy ‘squatters’ to scruffy versions of their parents in terms of overall appearance. The screengrab on the left was from May 25th, and just four days later their feathers have continued to grow through the down, which is also being plucked out as they preen. However, they still look very un-adult like when they huddle together to rest, lying flat with their heads down. If you didn’t know there were three Peregrine chicks in the nest, working out what that pile in the corner is could be quite a puzzle! Hope you can join us on Friday, and spread the word! Have you read the book The Snow Falcon by Stuart Harrison? I am reading it at the moment. It was not a deliberate choice. I picked it up with some others in a charity shop. It is a novel about other things that may not be of interest to you but there is quite a bit in it about the rehabilitation of a gyr falcon that has been shot. 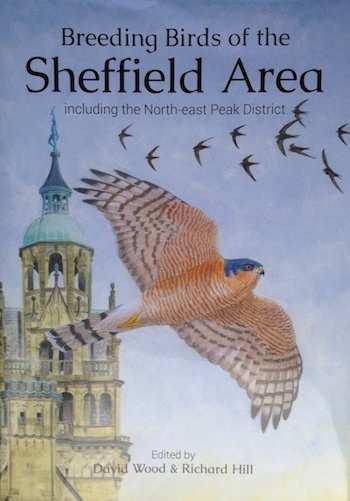 I am no expert on birds, had never even heard of a gyr falcon, but I am enjoying the book.